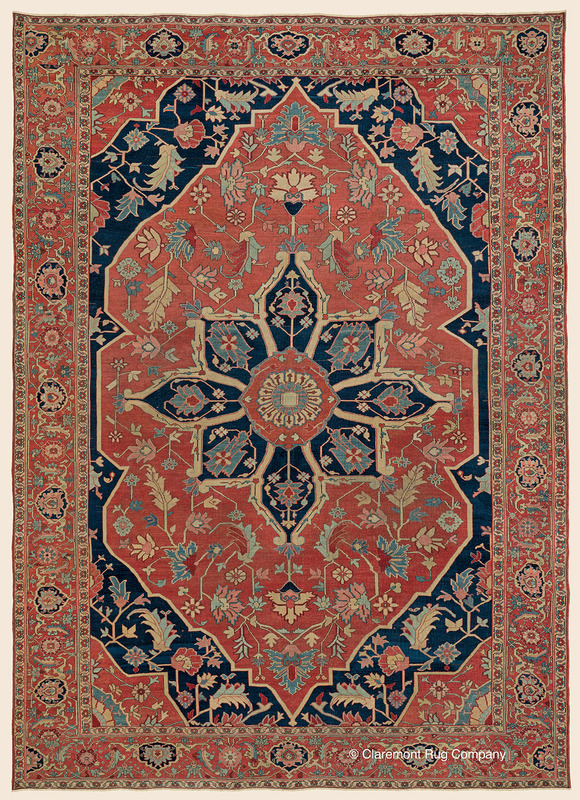 Search Our Inventory / All Rugs / 10&apos; 3" x 14&apos; 5"
A fitting example of our wide collection of antique Serapi rugs, this large room size piece offers a graciousness and warmth that would profoundly impact the ambiance wherever it is placed. Using dramatic larger leaf and flower motifs than traditionally scaled, each magnificent botanical form stands out against the classic red or blue backgrounds completely distinct. This silhouetting effect is amplified by a craftsmanship approaching the fineness of Town weaving. All emanating a deeply immersive atmosphere, the eloquent border, corners and reserve offer striations of the signature red tone of this spectacular piece.